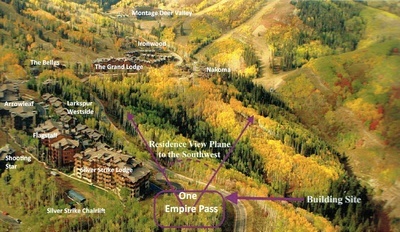 One Empire Pass is now complete and the first condo owners have moved into their new trophy ski in ski out condos! The developer still has a handful of gorgeous One Empire Condos available in 3 or 4 BR configurations. It's been nearly 8 years since the last new condo lodge in the Village at Empire Pass was introduced. We're excited to provide you with this update regarding One Empire Pass. All the residences span the entire width of the building. The dramatic North/South orientation will give you amazing views and direct sun looking up the mountain during the daylight hours, and lovely evening views of twinkling lights in Park City below at night. Every residence will have direct elevator access, eliminating central hallways and contributing to the light, bright, airy feeling of the residences. Superior concrete framed construction enabled the architects to increase the percentage of glass on the building exterior, and you will appreciate the towering windows and abundance of natural light. Please complete the form below to receive the additional info we currently have available regarding planned on-site amenities & services, and we will forward you current priority information about prices, floor plans, building location maps, etc. If you are coming to Deer Valley during this season, please contact us to arrange for a private tour of the building site. If you have been one of our subscribers for years, you'll recall that we specialize in helping Deer Valley insiders get priority alerts regarding prime new purchase opportunities ahead of the pack. We look forward to being your professional real estate resource in Park City & Deer Valley Resort areas.